R.A.W. International Ministries is a faith-based nonprofit organization, whose sole mission is to equip, empower and develop individuals to reach their fullest potential both spiritually and naturally. For over 24 years, Dr. Aretha Wilson has hosted the RAW International Gathering which is a multi-faceted, multi-cultural annual conference, where thousands of individuals of all ages gather daily to participate in an intense time of empowerment through holistic teaching, preaching and training seminars. R.A.W. 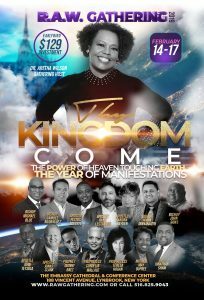 International Gathering is known for featuring renowned leaders such as Pastor Benny Hinn, Bishop Neil C. Ellis, Perry Stone, Bishop Jacqueline McCullough, Pastor Sheryl Brady and others. Countless lives of pastors, leaders, men, women and youth have been transformed and enlightened through this conference which has had an influence that reaches beyond the walls of the church, having a worldwide impact.